You may have noticed it's past Australia Day now and that I didn't get all these posts up in time. I did manage to complete the challenge on Instagram and so will spend the next couple of days finalizing these posts for completeness. #2 - Feral Hop Hog All Australian beer lovers would at least be aware of Feral's, almost ubiquitous, Hop Hog. Despite their efforts to re-brand Hop Hog as a Pale Ale, it's an IPA with wonderful pine and tropical fruit hop characteristics and bitterness. #15 - Bridge Road Beechworth Pale Ale I was lucky enough to try this beer at the source late last year. It's one of the best Australian Pale Ale's with nice biscuity malts laying a nice platform for tropical fruit, passionfruit and guava in particular, and citrus hop flavours to come to the fore. #27 - Noisy Minor Admiral Ackbar A beer that doesn't make it's way to Victoria anywhere near enough is the Admiral Ackbar from Noisy Minor range of Fortitude Brewery in Queensland. It's everything I want in an Imperial Red Ale, with lovely maltiness combining with heaps of hops. I love this beer, but it has to be fresh! It becomes almost sickly sweet if the hop bitterness fades. #33 - Little Creatures Bright Ale Prior to Little Creatures setting up their East Coast brewery in Geelong, I used to prefer this beer to their Pale Ale. It has light biscuity and some floral and citrus hops, that provide little bitterness. It's a beer that I could quite easily see people sinking pints of in a beer garden on a hot day; it's an easy drinker, whilst not being particularly complex. #50 - 2 Brothers Growler Growler is another 2 Brothers beer that I often overlook and probably shouldn't. 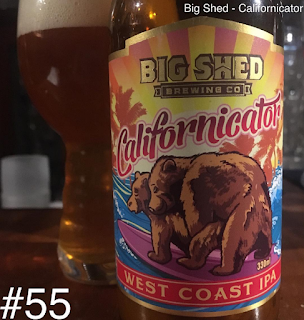 It says something about the beer that in can place in the Top 50 despite being a Brown Ale, a style that seems to be shunned in favour of paler offering come Hottest 100 voting time. The beer is doughy and caramelly, while bitterness (and some citrus) is added from the hops. I'll be sure to have some of these in the fridge come next winter! #55 - Big Shed Californicator I've talked about this beer a few times and, strangely, rarely talked about the contents inside the bottle. The label is one of Australia's best known, see above if you don't know what I'm talking about. That shouldn't take away from the contents - the beer is excellent with apricot the standout flavour, while citrus and pine hops are also present. It's an IPA that can only go up this countdown as Big Shed beers become more widely available. #70 - Murray's Angry Man Which Angry Man I hear you ask? It's the Pale Ale. Murray's decision to re-brand this Pale Ale to the same name as their Brown Ale is still one of the stranger decisions I can recall an Australian brewer making. Even stranger, I don't remember ever hearing the thinking behind the decision. In any case; when it's fresh this is a lovely Pale Ale with tropical fruit flavours, mango, peach and some grapefruit, bursting out of the glass at the drinker. #73 - Nail Clout Stout One of the premier beers on the Australian craft beer scene is Nail's Clout Stout. It's a Russian Imperial Stout that comes with a seriously hefty price tag, that almost matches it's ABV (11%). It's a seriously decadent beer with all the big stout flavours you'd expect; think chocolate, roast, molasses etc. It's a big, sweet beer that probably won't be for everyone. It's a great stout, but I probably wouldn't pay the asking price again. #90 - Burleigh 28 A beer that I'm constantly surprised that more people don't like, Burleigh's 28, came in at position 90. This Pale Ale is available nationwide and has really nice balance to it. There's bitterness as well as grapefruit and floral characters from the hops, while the caramel malts provide balance and don't over power the beer with sweetness. #93 - Feral Sly Fox Initially I quite enjoyed this beer, which had plenty of fruit and citrus accompanying a malt base that includes some wheat. Unfortunately one of the things that ruins this for me is that it gets a little cloying towards the end of drinking. Apparently these are less sweet out of the can - so I'll be sure to give those a try at some point. THE BIGGEST UNTAPPD CATCHUP EVER!